Bicon dental implants can offer you the smile you have lost, or the smile you have always wanted. You will no longer be embarrassed in conversation or while smiling and laughing. 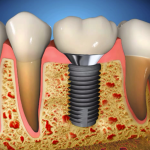 Only a dental implant can replace the root of a missing tooth. If a root is not replaced, bone loss will occur resulting in undesirable consequences such as the inability to place implants without bone grafting procedures. Bicon implants can eliminate the need for sticky denture adhesives, and even the need for dentures entirely. Traditional crowns, bridges, and root canals often fail — necessitating additional dental care. Dental implants offer a permanent solution, that cannot decay. Are you interested in implant dentistry but a traditional implant is not feasible? For most people suffering with the inconvenience of removable dentures or the embarrassment of missing teeth, traditional dental implant surgery is a viable option with high success rates. However, there are some cases where mini dental implants are a better choice for both economic and health purposes. Mini Implants are very similar to the full sized dental implants but are often recommended in cases such as securing a denture in the bottom jaw or insufficient bone density in the jaw. Plus they are also an option for people who only require a single dental implant (with a single restoration). Mini implants are a good alternative to dentures and bridges and are as equally as effective as their full sized counterpart. Mini Implants are often preferred to the full size implant which may be due to reasons of cost. The mini implant is cheaper than a full size implant. HOW ARE MINI IMPLANTS FITTED? This is a minimally invasive procedure which is carried out under a local anaesthetic. It tends to be quicker than the procedure for the full size implant .If they are used to secure a denture in the lower jaw then the process involves the insertion of a series of mini implants into this jaw at regular spaces. Your denture is placed back into your mouth and adjusted so that it sits on top of these implants and fits securely in place. As experienced implant dentistry we recognize that tooth loss can lead to an array of devastating consequences. Patients might lose their ability to enjoy their favorite foods, to speak clearly, and to experience high levels of self-confidence. To avoid these developments, Advanced Periodontics & Implant Dentistry offers several highly effective dental implant procedures. Read on to learn how dental implants can help you achieve a healthy mouth and an attractive smile. To schedule your personal dental implants consultation, please call us for a consultation at 514-934-0404. The implants are placed under the skin and into the bone at the first surgical appointment. This surgical appointment is performed in the dental office under local anesthetics with or with out oral sedation. 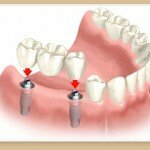 The dental implants are allowed to heal for a period of two (2) to six (6) months. After this healing time the implants are exposed at a brief second surgical appointment prior to placing a post inside. The post becomes the extension to which a crown is attached. The total process tends to take a period of four (4) to seven (7) months. Our team of cosmetic dentists are extremely well trained and very experienced with dental implants.